Over time, red has shifted from the colour of power to the colour of revolutionaries. In an interview, publicist Gerd Koenen talks about how red came to symbolise communists and socialists. In the ancient world and the Middle Ages, red was worn by Roman emperors, European rulers and popes as the colour of authority and power. Over the centuries though, it underwent a shift to become the colour of rebellion. During the French Revolution, the Jacobins and sans-culottes wore a red cap as a sign of their allegiance to the Republic. So the “bonnet rouge” became a symbol of emancipation from servitude, but also inextricably associated with the Reign of Terror in which the Jacobins stifled or executed any and all real or perceived foes of the French Revolution. The colour is still embodies this ambivalence today. In the 20th century, red was the colour of the labour movement, communism, and socialist movements. Here too the symbolic colour calls conflicting ideas like hope for a better life on the one hand and blood and suffering on the other (“today red, tomorrow dead”) to mind. In his book Die Farbe Rot. Ursprünge und Geschichte des Kommunismus (The Colour Red. The origins and history of communism), publicist and historian Gerd Koenen explores the rise of communism. He spoke to us about about the rich symbolism associated with the colour of the Red Century. Mr Koenen, how did the unlikely colour red come to be symbolic of the labour movement? Red is like a primal colour, after black and white. As the colour of blood, it represents the most intimate connection and the most extreme separation between people, the polar-opposite feelings of love and hate. Once people in the 1830s began talking about the “social revolution” that would have to follow the political revolution, red became colour of the labour movement. This development coincided with the modern ideas of “socialism” and “communism”. Red as a political colour – most visible as a red flag – competed with the variegated variety of feudal emblems, and increasingly with the tricolours of new national flags as well. In response to a variety that promoted separation, red symbolized the dream of a universal alliance of the “proletariat from all countries” and the overcoming of the enmity between their countries and nations. The Socialist International of 1889 then raised the red flag as its central symbol. So red as the colour of communists and socialists worldwide was the logical consequence of this development? The great social struggles before and after the turn of the century were the first time industrial workers really stood in the forefront of democratic and other emancipatory movements, and the symbolic space associated with political red expanded. The outbreak of the Russian Revolution in 1905 was the first time a whole widespread popular movement was bathed in a half hopeful, half apocalyptic flickering red. The linguistic proximity of “red” and “beautiful” in Russian may have played a role in creating a particularly effective association we see expressed in the name of the “Red Square” in front of the Kremlin, for example, which is also called the “Beautiful Square”. So it was not particularly surprising that once the Bolshevik victory of 1918 put him in power, Lenin used the historical concept of “communism” for his party and regime and raised the red flag (featuring a hammer and sickle) as the new state flag. This move can been seen as an attempt to overwrite the fact that the fall of the Tsarist regime in February/March 1917, in which the Bolsheviks played virtually no part, had already been completely immersed in red. The Bolsheviks’ so-called “October Revolution” was essentially a victory of red over red, that is, of the Bolsheviks over the other Russian socialist parties, who forced them into the role of “white” counterrevolutionaries and used terrorist tactics to repress them. The cover of the Austrian May Magazine in honour of Labour Day, 1898. 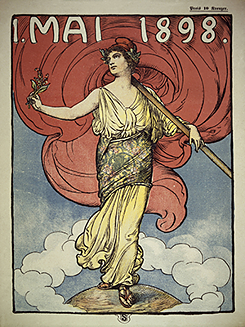 It features Marianne, the symbol of the French Republic. She is holding a Phrygian cap like the one the Jacobins wore during the French Revolution. | Photo (detail): © picture alliance (84019274) The colour red has become a symbol of political regimes outside of Russia as well, like in China. Were these individual deployments of red interpreted differently? Communism’s heyday has passed. Has this also weakened the symbolic colour’s radiance? In the West, the accetuated importance of the political colour red began fading after 1945 - apart from a brief and chaotic revival as part of the radical youth movements around 1968, which expanded into a “red decade” in the old German Republlic with the help of tens of thousands of the politically hyperactive who dominated the university campuses and some of the intellectual debates for a while. Social democracy, at least once it was decoupled from its Marxist heritage, turned the old, rich, passionate red of its emblems into a rather pale, striking red that no longer embodies so many messages critical of system. The collapse of the Soviet camp after 1989 did the rest. Today the People's Republic of China – in which the absolute ruling Communist Party clads itself in intense “red on red” within its exclusive sphere of power – clings to the staunchly preserved tradition, in which the Party’s claim to be China’s saviour is directly enmeshed with an old imperial mythology and a modern, revived supremacy in the international sphere. Meanwhile, the colour red has moved almost completely away from all the democratic and social emancipation promises of the labour movements of the 19th/20th century. Sarah Klein is a journalist and PR consultant. She is editor-in-chief of the Tea after Twelve online magazine and managing director of the Bunny Island communications agency. Copyright: Text: Goethe-Institut, Sarah Klein. This work is licensed under a Creative Commons Attribution – Share Alike 3.0 Germany license.